At Code Club, we believe that everyone should have the opportunity to learn to code. So when we heard about a club that had found a new and unique way to support a blind child’s coding, Katharine Childs, Regional Coordinator for the East Midlands, went along to find out more. I was keen to get Ted sat in front of a computer creating his own imaginative projects that he could share with the club, just as the other kids were doing. Steve started by researching other coding tools for children with visual impairments, but he couldn’t quite find what he was looking for. Undaunted, he decided to write his own system. I started tinkering with Scratch to see if I could leverage its excellent sound library along with some of the key code categories to give Ted that real coding experience. [The tool] had to use the keyboard as little as possible — just the arrow keys to navigate and the space bar to select an option. And of course, it had to have audible prompts, so I set to recording my own voice for that. Ted likes Star Wars and Thunderbirds, so I downloaded some sound bites for him to use in his projects. The result is T.E.D., the Talk Enabled Development project, which I saw in action during my visit. Ted told me that he really likes coding and would miss being able to take part in Code Club with the other children if he didn’t have T.E.D. to use. You can try the Scratch project for yourself here. To Steve, T.E.D. is very much a work in progress, and he listens carefully to Ted’s feedback about bugs and features. Next on Steve’s list is to improve the way that projects are saved. Steve and Rob do everything they can to ensure that Ted is included in every aspect of the club. At the end of last term, every child was presented with a Code Club certificate, and Steve got Ted’s translated into Braille. We’d like to congratulate Steve on being an outstanding volunteer who has demonstrated a fantastic commitment to the ethos of Code Club being open to everyone. We welcome everyone to share their own stories with us via our social media channels and with their Regional Coordinators. If you’d like to start a Code Club in your local community, host a club at your premises or school, or volunteer at an existing club, you can find information on this on the Code Club website. Prospective volunteers, interested parents, and educators are welcome to join us at our free regional meetups — find an event near you here. You can also enrol in our free online training course Prepare to run a Code Club, which will help you build your skills and gain the confidence to start your own club. Code Club festive competition: we have a winner! In October, we launched our first-ever competition exclusively for active Code Clubs. 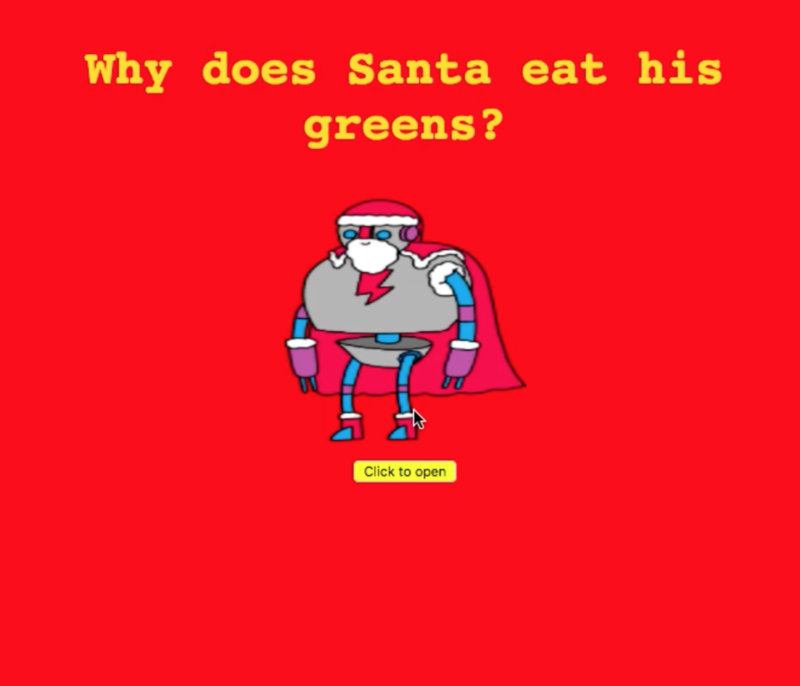 In keeping with the season, the challenge was to code a festive message using one of two Code Club projects as a starting point. We were super excited when the submissions started rolling in, and all in all we received more than 500 from clubs all across the UK. After the competition closed, the Code Club judges had a wonderful time looking at all your entries, which were creative, funny, and well thought-out. It was tough choosing a winner from among all the fantastic festive messages we received, but after much deliberation, we are pleased to announce that the winner is Jake, aged 9, from Henry Cavendish Primary School! I’m very happy to have won — Code Club is my favourite part of the week. We’d like to say how proud we are of how far Jake and the other kids have progressed in just a few months. They’re so creative and resourceful, and always helpful to each other. The whole club will receive prizes, and we will send out the winning entry as the official Code Club end-of-year festive message. If your club members weren’t able to take part this time, don’t worry: we’ll have more competitions, available exclusively for active clubs, coming up soon! If you need help with getting your club activated so you can take part next time, drop us a line at support@codeclub.org.uk.